An upscale restaurant offering any delightful freshly prepared dishes. Located just off I-95 and near several nice hotels. They get a lot of business from travelers along with a great support from the locals. 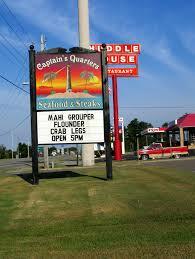 Great seafood dishes such as crab stuffed grouper, shrimp scampi, shrimp and grits and the Captain’s crab cakes. If you are looking for a steak, they offer a ribeye and NY strip, along with their popular prime rib. Their Italian dishes are also very popular, dishes such as, homemade lasagna, Chicken Parmesan, and Angel hair pasta with Marinara sauce. You need to leave room for dessert. All desserts are homemade and are delightful. The atmosphere is very nice and relaxing, creative decor. I had the 10 oz ribeye, baked potato and salad. Debbie tried the homemade lasagna. Great food, great service.